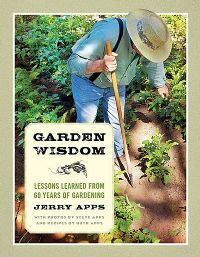 Garden Wisdom: Lessons Learned from 60 years of Gardening (Wisconsin Historical Society Press, 2012) by Jerry Apps charmingly combines his areas of expertise: Wisconsin farm history, farming and gardening. One of three books published in 2012 by this prolific author, Apps takes readers through the seasons on a gently rolling ride of memory and taste all through the prism of his garden. Starting with good basic gardening tips – how to site a garden, prepare the soil, and how to choose what to plant – the book moves into descriptions of Apps' favorite crops. And it is here that the text really begins to shine. We meet Apps' parents as they worked their land and a kitchen garden larger than some of today's backyards. We join them for planting, hoeing (the weed is, for Apps' family, the grower's arch enemy), harvesting, and preserving their crops. We glimpse his mother in her chair on a February evening with her stack of “promise books” a.k.a. seed catalogs and pencil dreaming of spring. We watch his father lead a team of horses to plow and find him later, in his nineties, with his trusty hoe still in hand. We learn a method for testing germination rates of seeds using an old wool sock and how to properly process horseradish for homemade sauce - pique the readers interest. We share meals (and thankfully learn recipes) featuring the vegetable in question as it would have been eaten then as well as tasty modern versions, courtesy of Apps' wife, Ruth. Everything from grape jelly to green bean casserole to a very scrumptious sounding navy bean soup is offered up to make the gardener's mouth water. Apps' years spent as an agricultural extension agent in Wisconsin and writing a weekly column for the local paper are evident in his easy tone. For my part I would have liked a bit more information on the nuts and bolts of how the farm worked. Apps touches on how the fields were prepared and how, for example sorghum was processed, but this garden-farming geek was left wanting. Such stories and details would have nicely rounded out his reminisces and the recipes here, and would also be quite timely given the increasing urgency of climate change. A companion volume on these processes would be a welcome (and surely well-used) addition to any gardeners bookshelf. It's also worth noting that Apps brought his garden to the front yard well before any one else gave such an idea a thought. His account of that – simply placing his garden in the best and most logical spot for it – in 1970's America was not a rebellious statement but rather good common sense put into practice. Apps' perspective on his whole yard as potential growing space should be inspiration for those feeling a lack of viable space for growing. Garden Wisdom is a touching memoir of a childhood full of practical advice that gardeners today can put to good use. For my part, receiving a review copy from the publisher and reading it connected me once again to my own rural heritage. It reminded me that whether my garden is a series of pots or a patch of land it connects me to my ancestors with every seed planted, every jar canned. Apps provides a perfect nudge for the person interested in growing their own food and learning to process it. Apps' genial tone and knowledgeable yet everyday voice are just the reassuring companions a novice needs. Tucking it into the shopping bag when heading out the door to the local farmers market wouldn't be such a bad idea, either. Paired with a solid reference book like Rodale's Ultimate Encyclopedia of Organic Gardening or Teeming with Microbes, the new gardener's library will be off to a fabulous beginning. Wisconsin Historical Society Press, 2012. Available from the Wisconsin Historical Society Press.